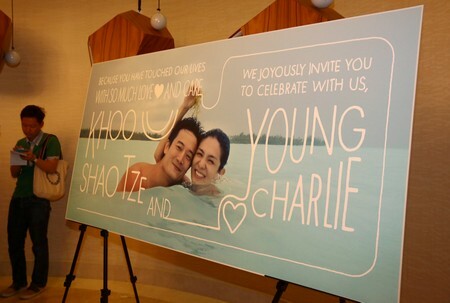 SINGAPORE - It was a glitzy, glamorous and star-studded affair at Charlie Young's wedding to Singaporean Khoo Shao Tze last Saturday. Guests included Hong Kong actress Gigi Leung, Hong Kong actress Anita Yuen, Malaysian actress Angelica Lee and her husband, Hong Kong director Oxide Pang and well-known Hong Kong director Tsui Hark. Local stars Andrea De Cruz and Pierre Png, who are friends of the groom, were present as well. Hong Kong superstar Aaron Kwok was also invited, but he could not turn up due to his busy schedule. 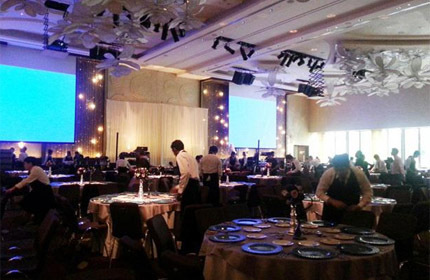 It was a frenzy as the stars arrived, with over 30 international media from Hong Kong, Taiwan, Singapore and Malaysia lined up outside the ballroom in W Hotel Singapore. Hong Kong-based Taiwanese actress Young, who had been in an onoff relationship with Mr Khoo for 19 years, finally agreed to marry him when he popped the question in May. Looking stunning in an white, offshoulder wedding gown, Young, 39, gamely posed for the media horde when she arrived with Mr Khoo. Upon prompts from the media, Mr Khoo leaned in and kissed Young's cheek, leading to cheers and congratulatory greetings from everyone. Young, who spoke in a mix of Cantonese and Mandarin, said: "I am very touched and happy today. "Many friends gave us their blessings. After I get married, I will divide my time between Hong Kong and Singapore equally." She added: "We've been dating for very long and we didn't agree on a time to get married. "We let nature take its course and got married when the feeling is right." Mr Khoo, 43, a trained lawyer and now secretary to the Indonesian Tourism minister, said: "It's been 20 years, it's hard for me to describe or say how I feel towards Charlie. To me, she is always an angel." For her wedding, Young rounded up close friends Gigi Leung and Angelica Lee to be her "jie meis" (sisters). The actresses also hosted the wedding banquet, while Taiwanese singer Valen Hsu was Young's bridesmaid. Leung, 37, told the media: "This is my first time being a wedding host, so I feel slightly nervous. But it is very fun. I am so happy for her." Lee, 37, said: "We are all very close, so I feel very touched for them. I even cried earlier in the day." Even though Kwok, 48, could not show up, his manager said he sent a video greeting and also gifted the couple with a diamond ring. One of the most excited guests was the groom's older brother, Mr Frank Khoo, 45. The fund manager told The New Paper: "We knew it would eventually happen, and we had been waiting for this for a long time." He added: "Of course, we are going to give him pressure to have babies soon, as he is already 43. The more, the merrier!" 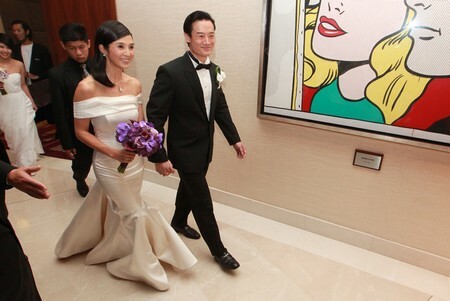 Hong Kong-based Taiwanese actress Charlie Young weds Singaporean boyfriend of 19 years Khoo Shao Tze, 43, at W Hotel. 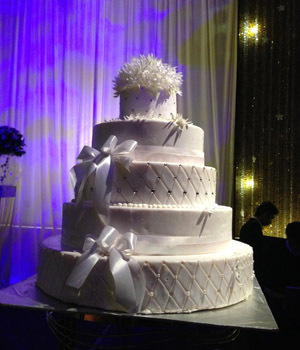 The newly-wed couple make their second appearance that night after the bride changes into a gown by Vera Wang. Bride Charlie Young (centre) holds the hands of bridegroom Khoo Shao Tze and bridesmaid Valen Hsu as they arrive at the lobby after their change of clothes. 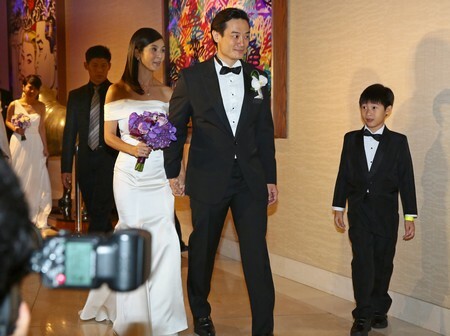 Hong Kong-based Taiwanese star Charlie Young got married to her longtime Singaporean boyfriend Khoo Shao Tze at W Hotel today. A report that said she will wed her Singapore boyfriend of 19 years was made public in the republic in late October. The 39-year-old wrote on Weibo earlier this week: "I would like to share a piece of happy news - I'm marrying my other half." Apple Daily Taiwan said the Hong Kong-based, Taiwanese star would have a simple wedding with Khoo Shao Tze, 43, at a five-star hotel. 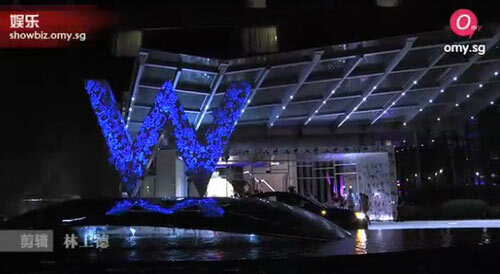 The wedding was held Nov 2 at the W hotel on Sentosa island. 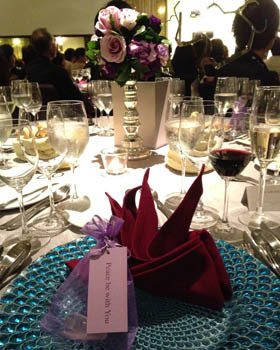 Charlie Young's wedding gift to her guests. (From left) Bridesmaid Valen Hsu, bride Charlie Young and bridegroom Khoo Shao Tze. The groom kisses the bride's cheek in front of the media. 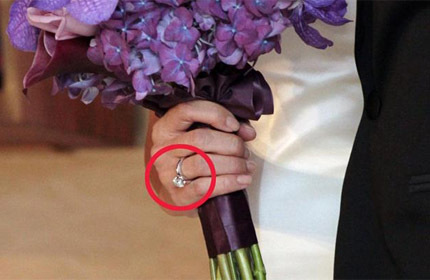 The 3-carat ring on Young's right ring finger is most likely her engagement ring. Bridegroom Khoo Shao Tze (right) kisses bride Charlie Young during a media photo call outside W Hotel's ballroom. Khoo, a trained lawyer, is working as the secretary to the Indonesian Tourism minister, according to Apple. The couple met in 1993. In 1997, she quit acting to set up an image consultancy with him. But the business ended in 2003 amid debts and she said the romance was over. In 2011, they were said to have reunited. He reportedly proposed six months ago. But, as reported, Young did not say yes to him till May, when she finally made her directorial debut with Christmas Rose. The wedding was well attended by the media as its guest list boasted of big names such as Aaron Kwok, Gigi Leung, Valen Hsu and more. 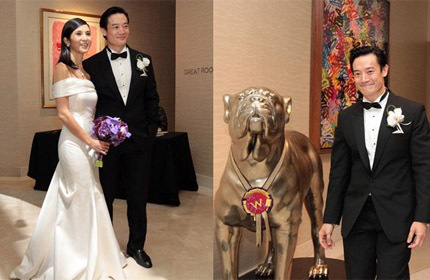 Among them were Singaporean actress and actor Andrea d'Cruz and husband Pierre Png. Singaporean actress and actor Andrea d'Cruz and husband Pierre Png speak to members of the media as they arrive at the wedding reception. Malaysian actress-singer Angelica Lee (left) and her husband, director Oxide Pang, arrive at the wedding reception. Malaysian singer-actress Angelica Lee speaks to members of the media as she arrives at the wedding reception. Director Tsui Hark waves to the media as he arrives at the wedding reception. Director Jacob Cheung speaks to members of the media as he arrives at the wedding reception. Hong Kong film and television actress Anita Yuen (left) and Aaron Kwok's manager Xiao Mei arrive at the wedding reception. Hong Kong film and television actress Anita Yuen (left) and Aaron Kwok's manager Xiao Mei speak to members of media at the wedding reception. Hong Kong film and television actress Anita Yuen. Hong Kong Cantopop singer and actress Gigi Leung (in green) and her husband Sergio arrive at the wedding reception.